Ever since the first glimpses of Windows 8 were shown well over a year ago, naysayers have been trumpeting the death of the start menu as the end of the line for Microsoft. There’s nowhere to go from here except down, according to them. Apparently, moving forward with the start screen isn’t the right thing for Microsoft to do and they should bring the start menu back at whatever cost. They say that the new start screen isn’t functional, requires more clicks or requires more effort to get things done. These people aren’t just the media types, they’re also the guy next to you at work, the salesman in the electronics store and your friends. They’ve made up their mind about Windows 8 after using it for a couple of hours on a test machine, not even giving it a chance to show its strengths before deciding that it will never be as good as what came before. As soon as Windows 8 was unveiled the start menu hacks appeared. First, during the Consumer Preview, a registry hack emerged to re-enable the Windows 7 start menu. When Microsoft stood their ground and removed that old start menu altogether, the independent solutions began. Now you’ve got a variety of solutions like Classic Shell and Start8, that “solve” the problem that Microsoft has created. Some of these guys are even making money off of the fact that the start menu is gone, and Samsung is actually considering shipping their own alternative. A quick search online shows just how passionately the media feels about the issue. The thing is, you don’t need the start menu. At all. The only reason you think you do is because it’s comfortable and familiar. Like a warm safety blanket, it never changed. Of course, it’s upsetting and jarring when things change like they have. The media certainly hasn’t taken it lightly and have given their opinion endlessly since it was announced. These start menu replacements are bad news for everyone. Not only are they unnecessary, they’re creating a inconsistent, fragmented experience of Windows 8 for the masses. Sure, it might make it easier to get your parents onto the latest OS, but what’s the point? You could have just spent half an hour showing them what’s different. It’s not hard. The companies that create this software are creating a perception that the start menu paradigm is here to stay, and that Windows 8’s new start screen is a great evil. It’s not, it’s just how change goes. Windows 7 was the end of the start menu, and Windows 8 is the beginning of something new. The media has also been propagating the message that Windows 8 is confusing and needs manual fixing to make it usable, since these kinds of shock headlines make for great page views. The thing is, the start screen replacing the start menu is actually just a glimpse into the future. It’s a look at a future where the desktop doesn’t exist like it does now in a series of windowed messes and clutter. Right now, you can live in two very different worlds in Windows 8, the start screen or the desktop. They’re like two entirely disconnected concepts, but as Microsoft’s vision progresses over the next few years, it’s apparent that the focus on the Windows desktop as we know it will be fading. At a guess, the company hasn’t toned down the spotlight on the desktop just yet because it needs to do it gradually. As users get used to living in the new user interface they can dial down the importance of the desktop. It takes exactly that, though, users using the new interface for them to actually become accustomed to it. By implementing all these third-party tacked on start menus, all we’re doing is putting ourselves in a position where we’re even more shocked when Microsoft makes another major interface change in the next version of Windows. This is especially true in the enterprise, where many business customers are turning their noses up at the OS because of “lost productivity” or “confusion” that their staff may experience. The question remains though, did the important people at those businesses actually spend time with Windows 8 to understand how it can actually improve the things they do? 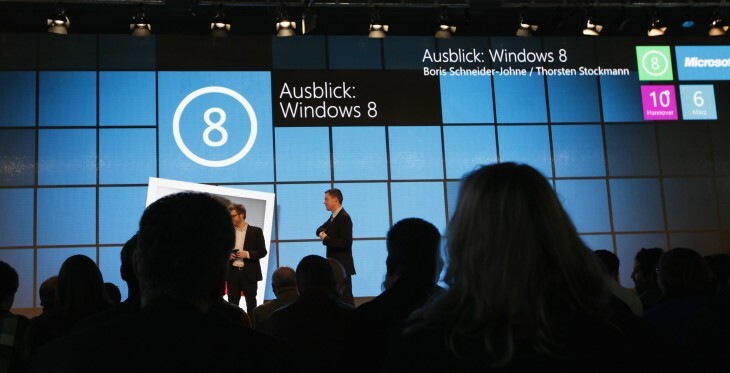 I’ve talked to a few businesses who’ve said they’re considering adopting Windows 8 but the big limitation for them is how much change it is for their users, and that they’re actually seriously considering buying corporate versions of Start8 to deploy to their entire fleet of machines to do away with the “confusion” that comes with the platform. Funnily enough, this sort of thing has happened before. Back in 2006, when Microsoft announced that the ribbon was the future of Office and that Office 2007 would not include any backward compatibility with Office 2003’s menu system the media was in a frenzy. The release was declared a “disaster,” “confusing” and (surprise surprise) a “productivity loser“. Fast forward to today, and we’re getting the same thing from the media. Windows 8 is apparently also a confusing disaster that somehow causes productivity loss. If you get where I’m going with this, I think it’s time we stopped listening to what everyone else is saying. Ignore the media. Ignore the people that tell you the OS is hard and confusing to use. Try it yourself and form your own opinions, rather than those of people that haven’t spent quality time actually trying to use it. If you do it now, rather than just following the crowd, you’ll be ahead of the curve when the next version of Windows is released.